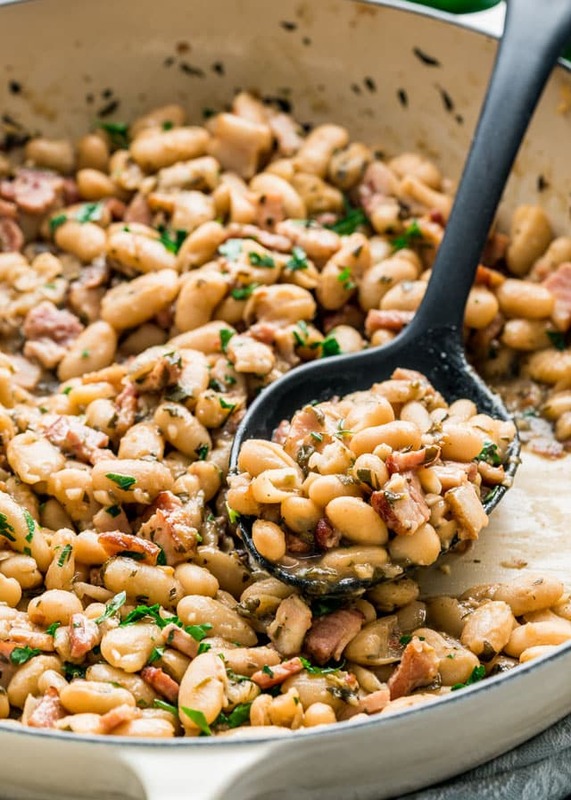 These White Beans with Bacon and Herbs are so simple to make, rich and savory, comforting, loaded with flavor and super delicious. I usually share something sweet on Fridays but many of you have been asking me for the bean recipe I made with the pork roast and I can’t blame you because these beans are the best. You’ll just have to wait for next week for my dessert recipe, it’ll be a surprise. So beans it is for today. 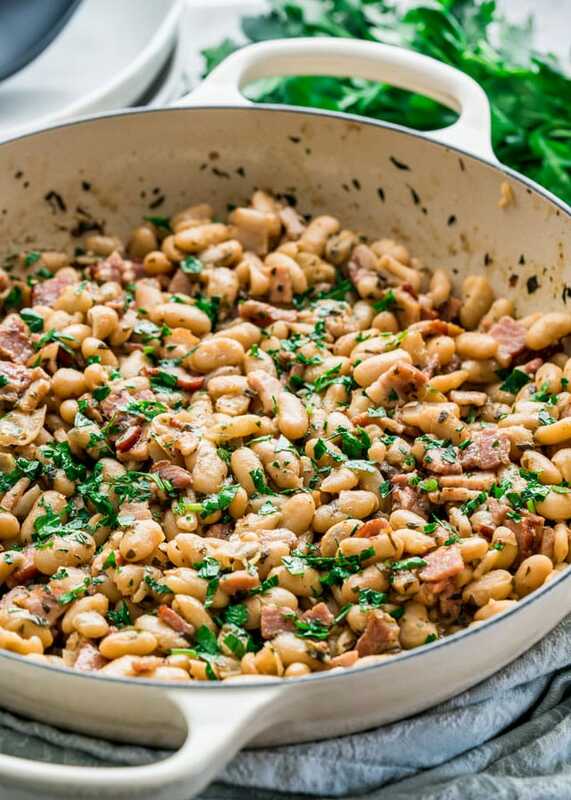 Beans and lots of bacon, loaded with yummy herbs. Truth be told, I usually serve mashed potatoes when I make a pork roast, however, this time I went for something a bit different with these beans and what a great combo it was. First of all, the bacon was an afterthought and I’m so glad I decided to add it, because we know that bacon really does make everything taste better. 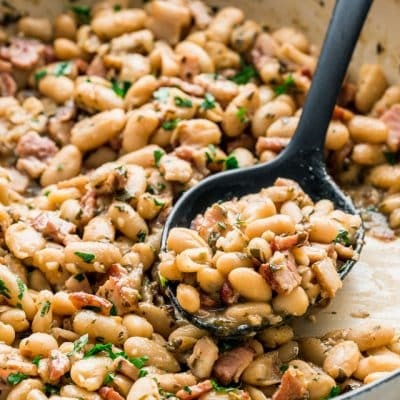 Plus, as you cook the herbs with the bacon and garlic, the smell is out of bounds, then the beans will cook in that bacon fat and really develop savory and rich flavors. 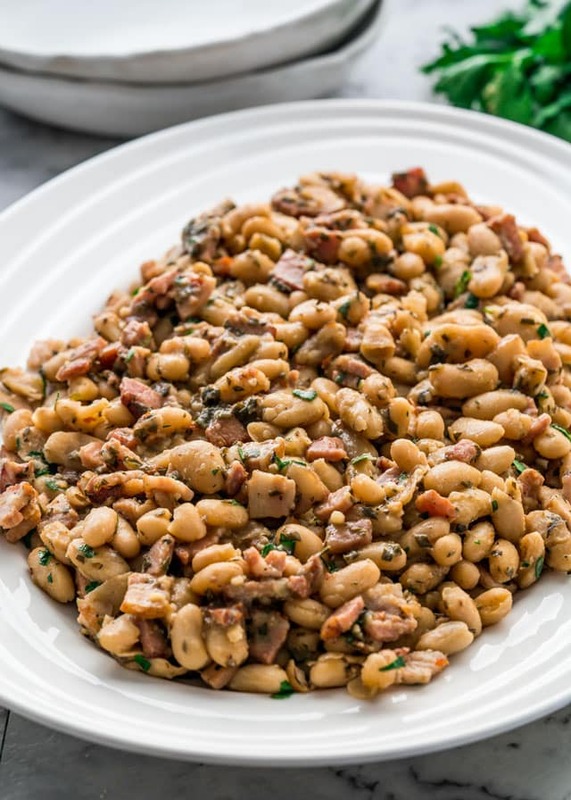 I love this recipe because of its simplicity, nothing complicated here, pork and beans, lots herbs and full of flavor. As you simmer the beans they will turn a bit creamy and the liquid will cook down, that’s what you’re looking for and that’s how you know when the beans are done. You want to cook the beans until most of the liquid has evaporated, but not completely. 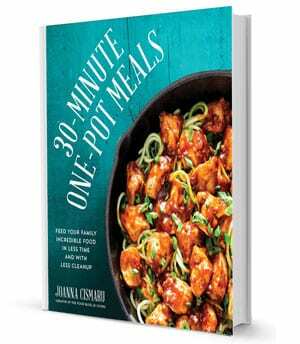 You can also make this with dry beans if you have more time on hand. I would just recommend soaking the beans in water over night, that’s what my mom always does because she never cooks with canned beans. However, I love using canned beans because they are so much faster and still just as delicious. Add the chopped bacon to a large skillet or Dutch oven and cook over medium-high heat for about 3 minutes until bacon is crispy. Stir in the garlic, basil, rosemary, 2 tbsp of the chopped parsley and red pepper flakes. Cook for about 30 seconds until the garlic becomes aromatic. Add the red wine vinegar and 1/2 cup of the chicken broth to the skillet and stir to deglaze the pan. All the brown bits should come clean from the bottom of the skillet. Add the beans and the rest of the chicken broth. Season with salt and pepper. Make sure you have enough broth to barely cover the beans, add more if needed. Turn the heat down to a simmer and cook the beans for about 15 to 20 minutes or until most of the liquid has cooked off. Taste for seasoning and adjust as necessary. Garnish with remaining parsley and serve warm. You can also make this with dry beans. To do so soak them in water over night. Follow the rest of the instructions, however they will take longer to cook, should take about 1 hour over medium heat. I made this last night for dinner with some Southern style cast iron skillet cornbread, and oh my goodness…sooooooo….delicious. Thank you for a wonderful & simple recipe. My family is not generally a fan of beans, but they loved these and said they were the best they had ever had. Thank you for the recipe! This is going into our standard rotation. That’s awesome to hear, we always say bacon makes everything better! I actually didn’t have bacon last week so I substituted with some crumbled breakfast sausage. Today I am making the recipe with bacon according to the recipe. I am sure it will be great. Let you know. Hello, looks like Ana amazing recipe! Can these be made ahead of time? Thanks! Absolutely, and then just heat them up before serving! These came out great! Had a container of white beans that I’d opened by mistake instead of chickpeas for a different recipe. It had been sitting in the fridge since no recipes for them appealed to me. Found this and it was great! I cooked the bacon whole, then took it out and added it chopped at the end to keep it crispier. Also skipped rosemary cuz I’m not into it. Truly delicious and simple! Ha! It’s there now, lol. 🙂 Thanks. I made this dish with a few changes as I wanted it to be a main course instead of a side. I sautéed shallots, garlic and field roast (till crisp) to add. After adding broth I added a few cooked artesian noodles to give it a little more substance. I served with a light sprinkle of shredded cheese and crumbled the bacon on top to keep it crisp. Garnished with a side of sour cream. Family loved it. I love beans when they are prepared like this they are so humble and flavoursome. So happy you like it. If you want the water to evaporate quicker, just turn up the heat to a medium or medium-high and in a couple minutes it’ll be almost all gone. I’m not particularly a fan of white beans, but do you think this recipe would work for butter beans? Any idea of if I would need to adjust the cooking time for them? Thanks! I’ve never used butter beans so I’m not quite familiar with them and what their cooking time is. Do they come in a can, I’m sure it might say on the can. Hi Lori in Maine! I would still soak them in water over night, then to cook them in the slow cooker, I would still only add enough liquid to cover barely cover them. 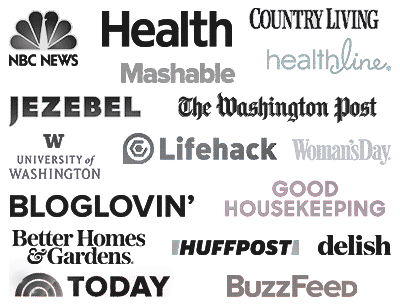 Jo, I’m fairly new to your blog and I’m having a hard time deciding what order to try the recipes in. Everything looks so good! I really like your videos. I am so glad you chose to give us this recipe today because I planned to make the pork roast this week end. Jo, I’ve only been subscribing to your blog for a fairly short time. The hardest thing is deciding which recipes to try first! I’m so glad you chose to share this recipe today because I’m planning to make the pork roast on Sunday. What a lovely week end meal, not too difficult and very economical. Looks yummy too! Thank you so much for all of your hard work giving us such a beautiful presentation of your recipes.